If I don’t get that rug for my house I may literally die? Photo: Halstead Property LLC. 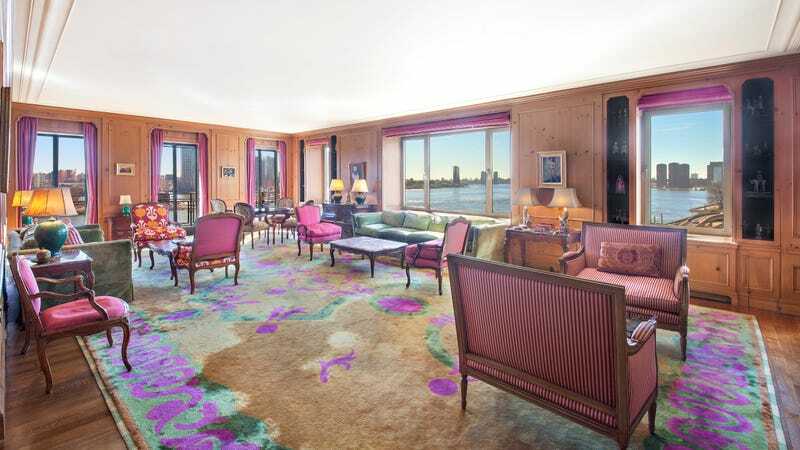 It’s unfortunate that Greta Garbo’s apartment—the place she famously tried to keep clear of publicity, looking much the same as when she lived there—has just sold for $8.5 million, because it is my ideal living space and I would like to move in tomorrow, thanks. “Garbo left the full-floor apartment complete with its own private elevator entrance to her niece, Gray Reisfield, who lived in it until 2012 and left it largely unchanged,” explained Women’s Wear Daily. “Indeed, the master bedroom is still adorned in Garbo’s favorite rose-hued Fortuny silk.” Wow—I had no idea that six words could be quite so magical, resonating so deeply in my soul. Just look at it! Wow, another rug whose acquisition is a life or death matter for me, personally! Photo: Halstead Property LLC. The apartment sold for 43 percent higher than its initial asking price, probably because it takes a stronger person than any of us to stand in Greta Garbo’s apartment, surrounded by Greta Garbo’s stuff, and resist recklessly throwing out enormous numbers. Especially considering the joint is “2,855 square feet and includes three bedrooms, three full baths, a home office, a laundry room and an abundance of storage space and oversize windows, each with automated shades,” plus oak floors and and Venetian crystal lighting, according to the New York Times. The Campanile, a very high-end (and very exclusive) co-op building on Manhattan’s east side, has been home to many a famous resident over the years, including English actor Rex Harrison and members of the bajillionaire Heinz and Rothschild clans. But its most famous resident was, without question, Greta Garbo, who bought a fifth-floor residence in 1953 and lived there until her death in 1990. “It’s very reminiscent of where she grew up in Stockholm — close to the water and with lots of sunlight,” her great-nephew Derek Reisfield, told the Times. “She liked seeing the boat traffic.” Same, Greta. Read further details in the Times piece then feast your eyes further upon a perfect color scheme! Pine paneling with deep vivid bright pink and green, my God, I am shivering with delight. Now, if you’ll excuse me, I’ve got to go find several yards of heavy fuchsia silk to make new curtains. They sell that at Ikea, right?